A group once led by Gov. Bill Walker wants Alaska to examine a different route for the $45 billion Alaska LNG project, arguing that Valdez is a better terminal and port than Nikiski, the site now preferred by Walker and the state. The "intramural spat," as one observer called it, was sparked when the Alaska Gasline Port Authority this month submitted a 210-page report to the Federal Energy Regulatory Commission urging the agency to select Valdez. The fight pits two Southcentral Alaska cities against each other for the right to host major facilities associated with the giant project designed to export liquefied natural gas, or LNG, to Asia. The project is supposed to operate for decades. Valdez Mayor Ruth Knight said Wednesday she believes Nikiski was a political decision designed to deliver jobs to the Kenai Peninsula. She noted it's the hometown of Rep. Mike Chenault, who was a powerful House speaker when oil giants and a pipeline company selected Nikiski in 2013. Chenault, laughing, brushed off the assertion. "I had no input into that whatsoever," said Chenault, a Republican who lost his speaker job this year when a bipartisan coalition took over the House. "I assume they based the decision on sound business practices and not on politics. Just because I happen to live there — I'm just lucky I guess." Activity at the Alaska LNG port could sharply boost employment and provide the winning city with revenue for decades — if the project is ever built. An 800-mile pipe delivering North Slope gas would end there. A large plant would super-chill the gas into a liquid for loading onto oceangoing tankers at a marine terminal. The port authority group asserts that selecting Valdez — where oil from the 800-mile trans-Alaska pipeline is loaded onto tankers — will save the state money while reducing environmental harm. That's in part because the gas line would follow the oil pipeline's utility corridor. Existing gravel pads and access roads could be used to support work camps along the Valdez route, sharply reducing the new construction required for the Nikiski route. Under the current Alaska LNG plan, the gas line would follow the oil pipeline's utility corridor from the North Slope to Livengood north of Fairbanks. It would leave the corridor there, traveling 400 miles south to Nikiski, about 175 miles west of Valdez. That route includes a 28-mile undersea section across Cook Inlet, home to critical habitat for endangered beluga whales, presenting steep regulatory obstacles, the group argues. The port authority says Cook Inlet's extreme tides and ice floes also pose a problem. It lists four large ships ripped from their mooring lines near the proposed marine terminal at Nikiski since 1999, damaging piers and causing other harm. That won't be a problem at Anderson Bay in Valdez, a deep, ice-free site in Prince William Sound. 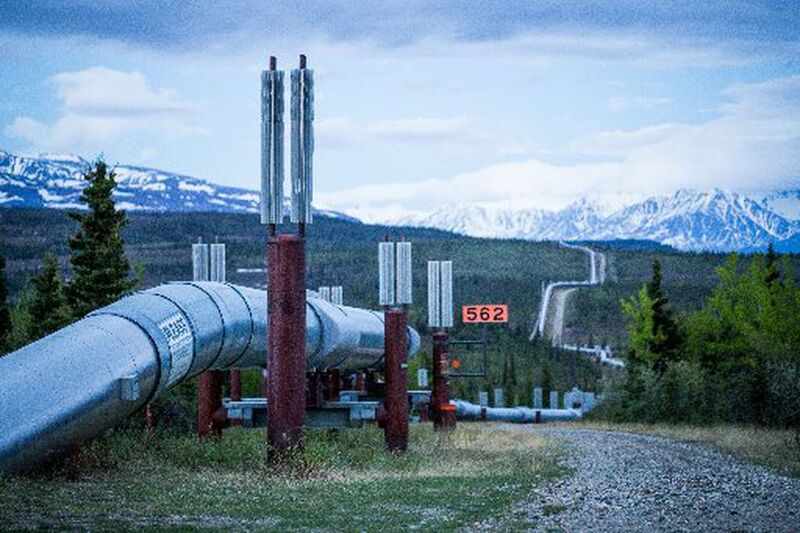 The 17-year-old authority, run by the city of Valdez and the Fairbanks North Star Borough, has long advocated for a project with the pipeline to Valdez to create jobs and revenue for the state. The group's report says project organizers have inexplicably provided the Federal Energy Regulatory Commission with little information to compare the cities, as required by federal law. The report was signed by mayors from North Pole, Fairbanks and the Fairbanks North Star Borough, plus Knight and Dave Dengel, the authority's chair. Project organizers studied numerous alternatives before selecting Nikiski, said Keith Meyer, chief executive of the Alaska Gasline Development Corp., the state agency that owns the project plans and is supposed to lead its development after Exxon Mobil, BP and ConocoPhillips backed out over economic concerns late last year. "We are not taking a second look" at Valdez, Meyer told the Alaska Senate Finance Committee on Feb. 14. Responding to the port authority's filing will cost the project "some months," Meyer said. Alaska LNG has already provided reams of project information to FERC, but must provide much more detail in hope of receiving an environmental impact statement to help federal agencies evaluate permitting decisions. If the state switched to Valdez, the project would be delayed "years," Meyer said. Such a step would require even more study. Valdez was once considered as a destination for a gas line, but Exxon Mobil and other partners selected Nikiski before the state became an investor in the project in 2014. The oil companies purchased several hundred acres of land on the Kenai Peninsula for the site, land the state plans to control, to move the project forward. More than 33,000 pages of draft reports detailing the project have been provided to FERC, the project's lead regulatory agency, with Nikiski in mind, Meyer said. "Valdez is a great location, but we picked Nikiski. That's going to be the site," Meyer told lawmakers. Supporters of the Valdez option argue the state's long-term interests outweigh potential short-term delays. Karl Kassel, mayor of the Fairbanks borough, said FERC needs to make the final call. "If an individual community or business makes the decision, they will make it in their own interest," said Kassel. "But because of the size of this project, the decision needs to be made by an objective third party looking at what's best for the state of Alaska." The filing, with 52-pages of analysis plus supporting documents, highlights Walker's turnaround. He was the port authority's project manager and general counsel before becoming governor in late 2014, when he inherited a gas line project to Nikiski. A former Valdez mayor, Walker has said little about the dispute. He supports the Nikiski option, reported E&E News, an energy publication, on Feb. 14. On Wednesday, Walker's press secretary emailed a one-sentence statement following requests for an interview. "Cities and boroughs have the right to participate in a FERC process, but I will not support anything that delays the monetization of our resources," Walker said. The Nikiski decision is a head-scratcher, said Knight, the Valdez mayor. "I really do feel this was a political play," Knight said. Federal agencies more than two decades ago issued environmental impact statements for a project to Valdez by the Trans-Alaska Pipeline System, proposed by Yukon Pacific Corp. Like many other gas line proposals, it was shelved. But information from that effort and other studies could help today's project "navigate" the permitting process if the proposed gas line is rerouted to Valdez, the filing says. Chenault said Nikiski's advantages are numerous, including plenty of flat land for the project to grow, an ample workforce on the Kenai Peninsula, and a proven ability to safely move ships in and out of Cook Inlet with few mishaps. "They have the right to do what they want as far as trying to dredge this thing back up," he said. "But I'm curious how much the state of Alaska will have to spend to satisfy their concerns that this was done right and fairly." Alaska LNG officials have said building a line to Valdez would require excavation of about 39 million cubic yards at Anderson Bay, the main reason the Valdez option is prohibitively expensive, the filing says. But the LNG project has not provided evidence of how that estimate was reached, and it's four times higher than "previous, FERC-adopted estimates," the filing said. It also "far exceeds" the material removed for the oil pipeline terminal that occupies about 1,000 acres. Alaska LNG does not account for offsetting costs if Valdez is picked, such as the elimination of the subsea pipeline and significantly less dredging for marine terminal construction, compared to the relatively shallow Nikiski site, the report argues. Larry Persily, oil and gas adviser to Kenai Peninsula Borough Mayor Mike Navarre, said Nikiski advantages include being almost one day closer to Asia. Tankers cost about $45,000 daily to charter. "Over many years, that's a lot of money," he said. Just because federal agencies gave a "permission slip" to the Valdez option roughly a quarter century ago — accepting Yukon Pacific's preferred choice — doesn't mean it's the best option today, Persily said. New permitting challenges with the Valdez route include the designation of two National Park Service Wild and Scenic Rivers — the Delta and Gulkana, he said. Persily said the "intramural spat" reminds him that the state's long-failed effort to build a North Slope gas line project faces political problems as well as high costs and market issues. "We need to get our act together behind a project and stop turning it into competition between cities," he said. Kassel, Fairbanks borough mayor, said the Valdez route is particularly important to his region because it could deliver inexpensive natural gas, replacing polluting heating oil or wood. The report says the Nikiski route would require a 30-mile spur line to Fairbanks, adding at least $50 million to project costs, while the Valdez route would bring the gas line much closer to Fairbanks. Kassel said he struggles to weigh the choice objectively. "But in my mind, it's not my responsibility to choose the route. It's FERC's," he said.